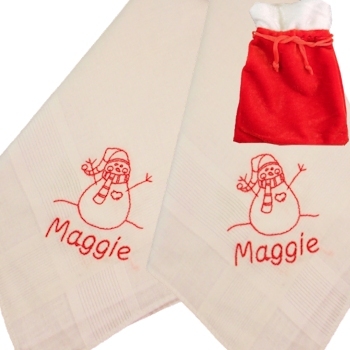 Two Christmas handkerchiefs personalised with a name of your choice and featuring redwork embroidered cute Christmas Snowman motif, presented in a organza gift bag. Two Christmas handkerchiefs personalised with a name of your choice and featuring redwork embroidered cute Christmas Snowman motif, presented in a organza gift bag. The perfect Christmas gift set with two festive theme cotton hankies, embroidered with a Christmas motif and name or wording of your choice. Choose from a pair or Ladies size or Mens size handkerchiefs (Childrens Hankies are the same size as Ladies). Two Christmas handkerchiefs personalised with a name of your choice and featuring redwork embroidered cute Christmas Snowman motif, presented in a organza gift bag. The perfect Christmas gift set with two festive theme cotton hankies, embroidered with a Christmas motif and name or wording of your choice. Choose from a pair or Ladies size or Mens size handkerchiefs (Childrens Hankies are the same size as Ladies). 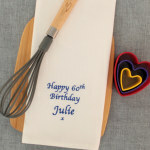 Type in the name or initials you want personalised and choose the letter font style you prefer.